Stylish looking, high-powered PMPs to integrate gaming soon? PMP and upscaling-DVD-player specialist Oppo has released some concept images of some possible (stress: possible!) future gaming handheld consoles. These interesting looking concepts have clearly taken design inspiration from both Nintendo's range of handheld gaming systems (from the original Game And Watch through the the latest DS Lite models) as well as some of the latest mobile phones (yes, we're looking straight at you LG Secret!). 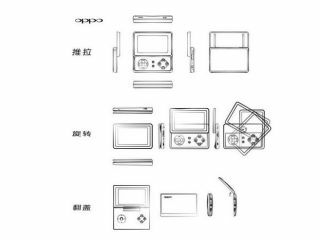 The use of a directional-pad (D-pad) in Oppo's latest conceptual designs for three possible new Oppo players, is the giveaway, which suggests the company wants to integrate gaming into future devices. "It has long been speculated that the new generation media chips from Rockchip and Ingenics would support 8/16/32bit gaming, it was only recently that the first Ingenic media chip player has GBA support, this new Oppo player could be the first Rockchip player to have a such emulation also. "Oppo has used ADI Blackfin chips to power their players, so don't be too surprised if this player ends up with the new generation Blackfin, much like the SmartQ T5-II." TechRadar has contacted Oppo for further clarification on the matter, so stay tuned for updates.